What to buy now? It's a question that's most succinctly answered right here on a daily/monthly/hourly basis thanks to the extensive shopping knowledge of team Who What Wear UK. However, at the beginning of each week, we're bringing you a concise and covetable edit of the newest best items to buy. These standout pieces are chosen from the new-in sections of our favourite brands and e-commerce sites and feature the kinds of items that you'll miss if you blink. We're your all-seeing eyes, ensuring the best of the best can stand a chance of getting into your wardrobe. Like so many other modern women, you shop high street to high fashion, extravagant to basic, outré to simple to find the coolest items. Some weeks you'll be spontaneous and give yourself a pat on the back with a hot-ticket item that makes your heart skip a beat (and your wallet feel lighter). Other weeks you'll look for ways to easily and quickly update and refresh the pillars of your closets—from work to party and back again. Whatever you're in the market to buy now, we promise we'll have it covered. So if you want to know what to buy now, scroll through the gallery below. This week, we're enjoying some laid-back bank-holiday vibes with light jackets (gingham and white denim are our go-to), statement tops (which will pair perfectly with jeans) and our latest high-street shoe obsession. Scroll down to enjoy some spring newness. The chicest collab of the year so far. These will lend a retro twist to any outfit. Give a wardrobe staple a new-season update via statement sleeves. Pastel blue hue plus striped belt equals swimsuit heaven. April showers never looked so stylish. We can't quite believe these are only £59. A dash of print for those who don't do print. This souped-up slip skirt has just shot to the top of our wish list. This will go so nicely with your favourite silk shirt. The yellow, the puff sleeves, the scoop neck! Get in my wardrobe now. Arket is currently winning our Best Strappy Shoes competition. You'll wear this slinky cami a million different ways. One of our team already has this in their basket. This is begging to be brought to a spring wedding. The contrasting prints on this Rixo dress make it seriously stand out. We'll be living in beige trousers all summer long. Chunky sandals are the summer trend that will tick both the comfort and style boxes. I think we might've just found the perfect swimsuit. For when you need a dose of utility style. A wardrobe staple that'll serve you for many seasons to come. The sleeves on this midi dress are to die for. We'll wear this every day when spring hits. These would look so good with cropped denim. Tuck this '70s-style top into your favourite pair of high-waisted trousers. The ideal pop of colour for the colour-ambivalent. Try layering this under a black shift dress. 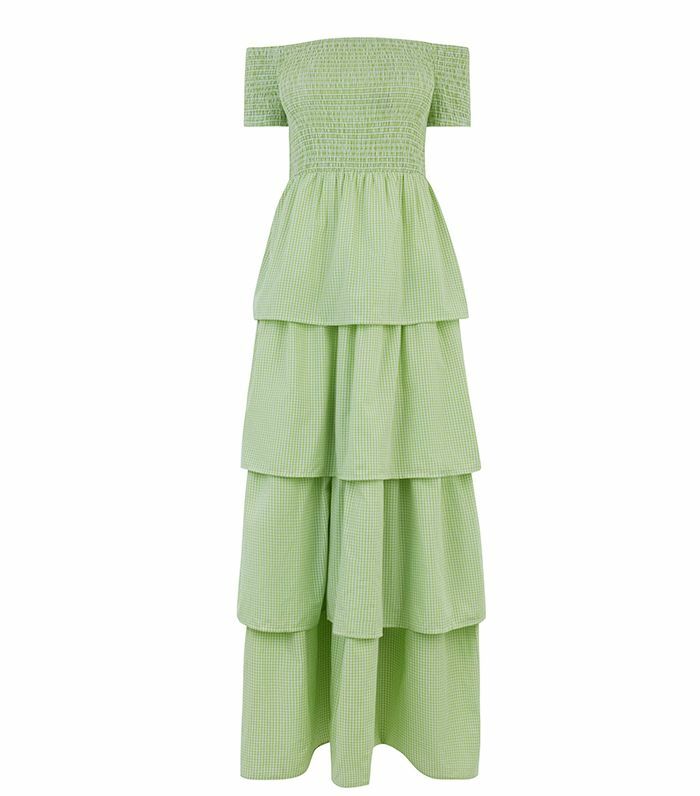 Surely the most luxe way to wear green this April. I think we've just found the perfect spring dress. This hue will complement all your last season beige separates. Throw this over your spring dresses for cooler English evenings. Ballet flats get the fashion treatment. Square neckline makes a high street swimsuit look so high-end. Florals for spring? Yes, please. This will be worth the investment—trust us. A more spring-appropriate alternative to a biker jacket. This would look cute layered over a white roll neck. Whether it's weddings or weekend drinks, this dress will give plenty of mileage this year. Freshen up your wardrobe with a hit of apple green. This would look so nice with just a white tee and knee-high boots. All we want to do is wear this on holiday with tan sandals. Prepare for April showers with this Arket parka. The gingham dresses just keep on coming. Another strappy heel to add to your collection. An easy way to add animal print to any outfit. Powder blue is this season's most flattering hue. A '70s classic with an Alexa spin. How could you not want to wear this floral showstopper? Slip skirts are still relevant, especially when rendered in rust orange. Tuck this blouse into tailored trousers for work. If you buy any bag this season, make it green. The print on this Arket maxi is perfection. This would look so good with high-waisted jeans. We've tried these on and can confirm they're chic and super comfy. The neckline on this dress is gorgeous. The team is in agreement that this is a serious high-street winner. Wear these with a white tee and black sliders for sunny spring days. These will go with everything you own—trust us. Pastel-coloured tailoring is a timeless new-season must-have. This dress looks so expensive. Style with Mary Jane flats and chunky gold hoops.